Human rights group Pusat Komas has urged the Kelantan government to resolve the grouses of the state's Orang Asli community instead of using strong-arm tactics against them. "The high-handed actions of the officers in arresting the Orang Asli and tearing down their blockade is a clear act of bullying by the enforcement officers and the Kelantan government. "We strongly urge the Kelantan government to address the root cause of the problem and not use the might of law on the defenceless Orang Asli community," said Pusat Komas programme coordinator Ryan Chua. He was responding to the arrest of 47 Orang Asli in Gua Musang yesterday. They were arrested after Kelantan Forestry Department officials, aided by some 100 personnel from the police General Operations Forces (GOF), broke and removed a month-old barricade to keep out loggers. The Orang Asli community there claimed loggers have encroached their ancestral land but the Kelantan government insisted they were obstructing legitimate logging activities which is a major source of state revenue. Chua said the Kelantan government must stop intimidating and harassing the Orang Asli community while the police must release all 47 detainees in order to initiate proper discussions with the community. Meanwhile, Centre to Combat Corruption and Cronyism (C4 Centre) said it was alarmed by the arrests. "C4 Centre had worked with these communities closely and its recent efforts to bring officials to Gua Musang and hear the concerns of the Orang Asli saw various pledges to uphold good governance and protect the rights of these poor and marginalised people, and together find peaceful ways out of this impasse. "These lofty promises were broken yesterday," said C4 Centre director Cynthia Gabriel. Cynthia said it was deeply troubling that the Kelantan government chose to be aggressive and prioritise profits over people by roughing up the Orang Asli community. "(Their) only 'crime' is to protect their land and their homes in which they have lived for hundreds of years. "Targeting them as if they are brutal criminals is a black mark for the Kelantan Government, who espouses Islam as its core principles in governance. "Where did these values go when it comes to unbridled logging in the state?" she said. Cynthia said there needs to be better policy making on forest management and urged the Kelantan government to impose a moratorium on logging around Kuala Betis in Gua Musang. Joining the chorus of condemnation is Lawyers for Liberty, which said it was shocked and appalled by the arrests. "It is well known that the Orang Asli are one of the most underprivileged and marginalised communities in the country. "The Kelantan government and its agencies, rather than assisting them, have chosen to collude with loggers and exploit their customary lands for timber, and now cruelly arresting them for merely standing their ground and defending their rights," said Lawyers for Liberty executive director Eric Paulsen. Paulsen called for the immediate release of the Orang Asli and urged that their rights be recognised by both the state and federal governments. Meanwhile, Parti Amanah Negara Youth deputy chief Faiz Fadzil said the arrest of the Orang Asli were "unfounded" as they were the forest's legitimate dwellers and not outsiders. As such, he said the Kelantan Forestry Department had no power over the Orang Asli. "The law was abused for the interest of certain quarters with complete disregard for the people's rights and freedom as enshrined in the Federal Constitution." He also urged for those arrested to be released immediately. 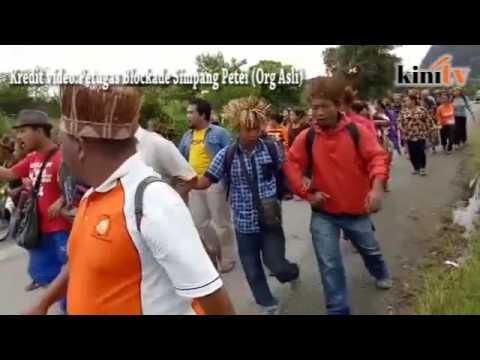 Meanwhile Jaringan Kampung Orang Asli Pahang JKOAP wants Kelantan Menteri Besar Ahmad Yakob and Prime Minister Najib Abdul Razak to intervene and secure the release of the detained Orang Asli, and in one swoop put a stop to logging in their ancestral land. This, said the native rights NGO in a statement, will put to rest the conundrum over their land and the encroachment of loggers. JKOAP added this should be a matter of course since the report by the task force investigating the matter was already handed to the deputy prime minister. Last month, Ahmad said logging is the state's largest source of revenue. He said RM172.96 million, or 29.12 percent of the state's projected revenue of RM539.8 million for this year, will come from logging. The police managed to secured a remand order to hold the 47 detainees for two days. A senior federal counsel told the Federal Court today that it should adopt the decision from the case of R Subashini vs T Saravanan in defining the definition of "parent" in the Federal Constitution to mean singular. Counsel Arik Sanusi Yeop Johari, who was representing the Education Ministry, further showed the definition of "parent" according to four English dictionaries to mean a single parent, and parents to show plural in the dictionaries. He was trying to prove the point on the third question of law in the M Indira Gandhi vs K Pathmanathan @ Mohd Ridhuan Abdullah's case today, that the apex court should accept the definition of "parent" within the constitution to mean singular. Whether the mother and father (if both are still surviving) of a child of a civil marriage must consent before a certificate of conversion to Islam can be issued in respect of the child. Arik Sanusi, who is the director of the syariah section of the Attorney-General's Chambers also told the court that the subject matter in this case concerned Islamic law and Muslims, and for this matter, the civil court had no jurisdiction. However, when asked by Chief Judge of Malaya Zulkefli Ahmad Makinudin, who was leading the five-member bench, that the constitution stated that a singular word would mean plural, while plural would also mean singular, Arik Sanusi was not able to address the issue. Another senior federal counsel, Shamsul Bolhassan, told the court that as conversion to Islam of a minor falls under Islamic family matters, the rightful jurisdiction should be the syariah court and not the civil court. He also said since the Perak registrar of muallaf had issued the certificate of conversion, it was a conclusive proof. But when asked by Justices Zulkefli and Abu Samah Nordin on who testified that the certificate was valid, the parties representing the government could not answer. 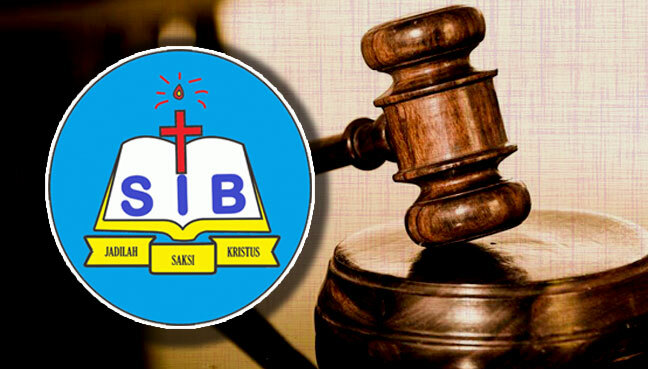 Queried on the evidence of conversion, Shamsul said the certificate was issued after the registrar was fully satisfied that a parent had consented. “The requirement of the consent from the father is good enough,” he said. Lawyer Hatem Musa who appeared for Ridhuan told the court that he has adopted the submissions made by the federal counsels. State legal adviser Rohana Abdul Malek, who appeared for Perak Islamic Department and Perak registrar of muallaf, told the court that Section 96 and Section 106 of the state enactment are stand-alone provisions and do not need to be read together, meaning single parent consent is sufficient without the need to recite the kalimah syahadah (affirmation of faith). “The documents from the religious authorities are conclusive proof of that and can be relied upon on the status of (conversion) of the person,” she said. Indira Gandhi, a kindergarten teacher, is seeking determination from the highest civil court in the country, whether the unilateral conversion of her three minor children in 2009 by her former husband was lawful following the certificate of conversion issued by the Perak's Registrar of Muallaf. The children were converted without their presence and the recitation of the kalimah syahadah, whereby a certificate by the registrar was issued. It was reported that a bill containing the amendments to the Law Reform (Marriage and Divorce) Act was tabled in Parliament last week, to prevent unilateral conversion, where children from a civil marriage would require consent from both parents if the child was converted. Lawyer Fahri Azzat for Indira Gandhi submitted that the case of Subashini should be disregarded on the interpretation of a parent. At the last session two weeks ago, they had asked for a re-visit to the Subashini case. Another lawyer Aston Paiva said the recitation of the kalimah syahadah is an essential ingredient to determine if a person is a Muslim, as defined in the Perak constitution. K Shanmuga, the third counsel for Indira Gandhi, told the court that the issue here was whether the state government was right in issuing the certificate of conversion. He said as long as both the parents are alive, consent ought to be given by both of them if the children are underage. The bench deferred in giving its decision to a date to be fixed. Besides Justices Zulkefli and Abu Samah, the other judges are Chief Judge of Sabah and Sarawak Richard Malanjum, and Justices Zainun Ali and Ramly Ali. Police have arrested more than a dozen Orang Asli activists in their crackdown on the community's anti-logging blockade in the interiors of Gua Musang, Kelantan. Jaringan Kampung Orang Asli Kelantan representative Jamali Ayau said those arrested have been taken to a school near Pos Petei. When contacted, Gua Musang police confirmed the crackdown but could not say the total number arrested. Lawyer Siti Kasim, who represents some of the blockade activists, said 18 have been arrested so far. "I am very upset and angry. All of us must rise against this treatment towards our indigenous people! "They are doing us a favour in protecting our forest!" Siti said on Facebook. The blockade at Balah Forest Reserve was erected in October to stop logging, which the Orang Asli community said has affected their water source. Orang Asli villagers from Pos Balah, Gua Musang, said they are willing to sacrifice their lives to protect their blockade at Balah Forest Reserve. The Committee to Protect Journalists (CPJ) has called on the government to drop all criminal charges against cartoonist Zunar and cease harassing him for his work. This was after Zunar, whose real name is Zulkiflee Anwar Ulhaque, was arrested for sedition last Saturday. It came a day after a group led by Penang Umno Youth chief Rafizal Abd Rahim thrashed Zunar's exhibition of cartoons critical of Prime Minister Najib Abdul Razak. "Rather than arresting and threatening one of Malaysia's most prominent cartoonists, the authorities should instead identify and prosecute those responsible for this crude and egregious attack on press freedom. "The government's harassment of Zunar has reached dangerous proportions. It should stop immediately," CPJ's senior South-East Asia representative Shawn Crispin said today. Zunar, a recipient of CPJ's International Press Freedom Award in 2015, was on Sunday released on bail. CPJ said its research showed Najib had used the Sedition Act 1948 to stifle critical reporting on the 1MDB scandal. Meanwhile, the International Federation of Journalists (IFJ) also condemned Zunar's arrest. "The latest arrest of Zunar demonstrates the ongoing blatant attempts by the government to silence critical voices. "The incident follows a long pattern of harassment against the cartoonist, including legal harassment under the country’s controversial sedition laws," IFJ said. It also called the charge against Zunar to be dropped, calling the Sedition Act a "toll of repression for the government to threaten and intimidate the country's media and other dissenting voices". On top of the ongoing investigation, Zunar also faces nine charges under the Sedition Act 1948 for criticising the jailing of PKR de facto leader Anwar Ibrahim in February last year. He had also slammed the judges who delivered the decision. If convicted, Zunar faces a maximum sentence of 43 years in prison. Hadi of PAS tangos with Najib of Umno to bait the rakyat with the amendment of the syariah laws, with nothing concrete. 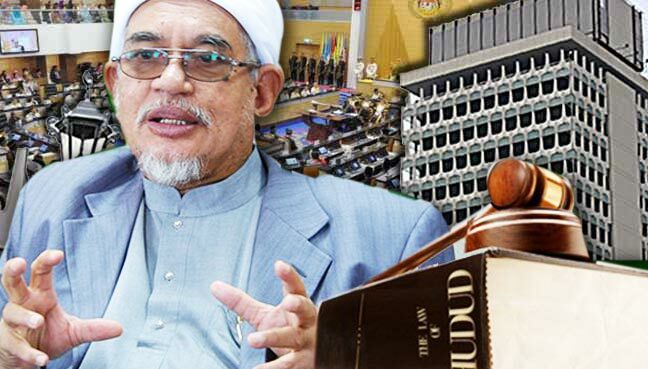 Finally, one perceptive and intrepid Muslim legislator has pointed out the obvious: that the back and forth over PAS president Abdul Hadi Awang's motion to amend the Syariah Courts (Criminal Jurisdiction) Act 1965, or Act 355 is simply a political ploy by PAS and BN so that they can claim to be the real champions of Islam. In the latest development, Hadi, on the last day of the current Parliament sitting, has again tabled and deferred his motion, citing the need to allow time for it to be studied. This was similarly done on the last day of the May Parliament sitting. According to Salor state assembly person Husam Musa the action indicates that Hadi's motion will only be debated after the 14th general election. It also explains why the Government had initially prioritised the motion when it was first tabled but now has allowed it to be deferred to what Husam sees is an "equilibrium point" that is beneficial to PAS, Umno and BN component parties. "It is good for PAS as their approach will not be seen as a failure. It also creates a 'feel good' feeling to maintain the political relationship between PAS and Umno, particularly near the general election. "It is an effective recipe. It creates a win-win situation for all three parties ahead of the general election with a smart partnership," he said. What Husam did not need to point out was that the latest move is another sign that PAS and Umno are likely to go into the next elections as allies with the intention of knocking out Amanah, Parti Pribumi, PKR and other opposition parties vying for the Malay Muslim vote. But is what is good for PAS and Umno beneficial for the country or even Muslim community? Progressive Muslim leaders and groupings have already voiced alarm at the proposed greater empowerment of syariah courts. “Let’s remove the label “Islamic” and really see the way justice is administered in the shariah courts now. There are thousands of Muslim women who have been waiting for years for their divorce to be finalised, or for the courts to decide on their rights to maintenance or custody. Do you think these same courts have shown that they are ready to receive more powers to impose heavier punishments, just because someone like Hadi calls it Islamic law? Zaid, Husam and other Malay Muslim leaders should also emphasize that the present peace and prosperity enjoyed in Malaysia is due mainly to the secular system of government as laid down in the Constitution. It is not because of any Islamic system that the Malay and Muslim elite and middle class especially have done so well. The secular system and its western-based law and economics – and not a Islamic system or Islamic law and economics - has seen wealth creation and taxes levied on non-Muslims primarily that has enabled the Malay community to rise in socio-economic mobility within one generation - a rise that is unprecedented and unrivalled anywhere in the world among Muslim nations, except for the few oil nations of the Middle East. And let us also not forget: the gender equality principle of our secular system which has enabled Malay women to be of equal status and to advance to where they presently are. Today, it is understandable that the Malay Muslim community is concerned with the rising cost of living, the 1MDB scandal, the endemic corruption and abuse of power, and what appears to be a gloomy future for their children. However the remedy for these concerns does not lie in a more Islamic system or more Islamic law and economics. The remedy lies in the Malay and Muslim community using their right to vote – incidentally, a foundation stone of a western-based democratic system, though not an Islamic-based one – to change the government of the day. And before the election, the remedy lies in requiring the Government to be accountable and transparent, and not to abuse the right to dissent or to undermine our constitutional freedoms. So what do Hadi and the rest of the PAS leadership have to say about these real life issues facing the country and the rakyat. What do they have to say and do about elections which are gerrymandered; about an authoritarian and corrupt government, about the demands and concerns that they had previously subscribed to and rallied for, but have now abandoned. The PAS focus on the amendment to Act 355 and the coming rally they are organizing in support must be shown to be what it is. Political hypocrisy and wayang which will only serve the narrow interests of Hadi and his tango with Umno. Hadi has also now warned non-Muslim legislators not to behave like Ahok. On the contrary, Malaysia's non-Muslim legislators and community need to behave like Jakarta’s Christian governor, Basuki Tjahaja Purnama. Not only do we have equal rights in this country but we are also an important factor in helping check the rise of a less tolerant and more fundamentalist Islam. Moderate and sensible Muslim colleagues will want us to continue our opposition to Hadi's game plan for they know the disastrous outcome that awaits them too should PAS's or Umno's Islamic state be advanced through this devious strategy. A total of 63,210 internet dongles would also be distributed to schools in these states. "Through the 1BestariNet Phase 2 service project, the Education Ministry will provide a teacher's data plan of 2GB/month and a personal device for all teachers in schools with 4G coverage," read the letter. The letter, which requested the state education departments to facilitate the distribution of the devices, was signed by the ministry's education technology division director Zaidi Yazid. It added teachers in other states would receive the smartphones next year but did not specify how many smartphones were involved. Under the plan, teachers will be provided 2GB of LTE data on their Altitude device and another 2GB of broadband data on the dongle. The smartphones for the Kuala Selangor, Sabak Bernam and Hulu Selangor education department were distributed in a ceremony on Nov 22, attended by Kuala Selangor MP Irmohizam Ibrahim. As for the Petaling Perdana and Petaling Utama education department, a distribution ceremony was held yesterday, attended by Puchong Umno chief Mohamad Satim Diman. For the Sepang and Klang education departments, they were handed out in a special ceremony this morning by Sepang Umno chief Marsum Paing. The PAC hearing on 1BestariNet took place on March 17 last year and a report on the matter was tabled during the Oct 17 Parliament sitting which concluded on Nov 24 this year. The first phase of the 2.5-year 1BestariNet contract was worth RM663 million, running from Dec 13, 2011 to June 12, 2014. According to the PAC transcript, the 1BestariNet would be extended for another three years at a cost of around RM1.4 billion. The PAC chairperson at that time, Nur Jazlan Mohamed, had criticised the extension. "So that is why the next question (that) must (be) asked (to) the ministry after this is why (did) you issue new contract? isn't it? That is all. "They said the contract did not fail, we say it did fail," he was quoted as saying in the PAC transcript. YTL Communications Sdn Bhd (YTLC), the company responsible for 1BestariNet, in a sponsored article on tech site SoyaCincau yesterday, defended the project. Under the project, YTLC was to provide 4G connectivity to some 10,000 schools as well as to supply the Virtual Learning Environment (VLE) platform. YTLC said it had set up base stations called 1BestariNet Receiver Integrated System (1BRIS) telecommunication towers near schools to ensure stable 4G coverage. "To enable this, YTLC had to acquire approval for all local councils before they could proceed. "Due to delays in obtaining the required approvals, the progress of construction was delayed," he said. Education Minister Madzhir Khalid last week also denied the project was a failure, citing a similar reason of delays in obtaining local council approval. However, the PAC report cited other problems, including the underutilisation of the VLE platform, which licence cost RM250 million a year and internet speed not being up to mark. The PAC report found that the usage of the VLE platform by students was at 0.17 percent to 0.63 percent, teachers (0.57 percent to 4.69 percent) and parents (0.01 percent to 0.03 percent) based on an analysis in March 2014. The Education Ministry, in its response to the PAC, said the 1BestariNet project was more focused in preparing the infrastructure in the first phase but expected some 3.5 million students to use the platform in future. The PAC also found the project did not comply with procurement requirements including obtaining approval from the the ICT technical committee under Malaysian Administrative Modernisation and Management Planning Unit (Mampu) and undergoing a value management process. The PAC also said the Education Ministry's excuse that it wasn't aware about the value management process was unacceptable. The committee's finding also found that only 6.9 percent of some 400,000 anti-virus licence which the contractor was required to provide under the contract was utilised by the schools. The Education Ministry said the anti-virus programmes were not utilised as the schools' chromebooks already have existing anti-virus programmes. The PAC investigation was in response to the auditor-general's report which concluded that the 1BestariNet project did not meet its objectives. Following the hearing, the PAC asked that the auditor-general to conduct further auditing on the project as well as a review of the contract. 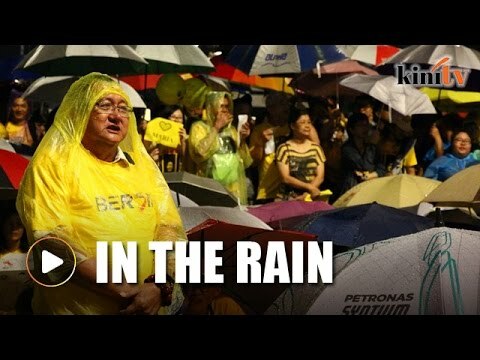 Heavy rain did not wash out the street party that greeted Bersih chairperson Maria Chin Abdullah as she arrived at the corner of Jalan Raja, nearby Dataran Merdeka, at about 9pm tonight. The slow drizzle that soon became a downpour did not deter some 600 of her supporters who merely opened their umbrellas and put on their raincoats. They started gathering since about 8pm after earlier reading news of her release from detention under the Security Offences (Special Measures) Act 2012. "The heavier the rain, the stronger our spirit will be!" said the night's emcee, Bersih steering committee member Farhana Abdul Halim. She earlier said that tonight would be a celebration for Maria's supporters who had held nightly vigils at the site throughout her 10 days of detention. In her speech, Maria thanked the crowd for their relentless support since her arrest under Sosma. "What will happen to me, I do not know. But I hope if anything happens to me, the people will continue with the struggle to abolish Sosma." She gave her promise that Bersih will continue its fight for clean and fair elections in the run-up to the next polls. "We will show which government that we want. Hope everyone will find a list of 10 names and bring them to register as voters. "We have to start as soon as possible or else we will not be able to make a difference," said Maria. At the end of her speech, one supporter started a chant of "Bebas Anwar!". Former Bersih chief and lawyer Ambiga Sreenevasan agreed with Maria on the fight to abolish Sosma. "We must carry on our fight. Now we have a new fight, a fight against Sosma," she said, adding that Maria's courage has inspired many Malaysians. "Today, history has been made and we are celebrating it at this historic spot. Who would have thought that this lady named Maria would take the country by storm. She has taken the world by storm." The vigil ended peacefully at 9.30pm after Maria, who was holding a bouquet of yellow flowers and waving at the crowd, left. COMMENT The headline in The Sunday Star screams, ‘Stronger now for the next polls’. Has Najib Abdul Razak not heard the expression, ‘Pride cometh before a fall’? He has two powerful weapons. It is for Malaysians to destroy them. Does one measure political strength by the ability to jail the leader of the Bersih movement, Maria Chin Abdullah? The 60-year-old mother of three was detained in a police raid, and placed in solitary confinement, on the eve of the Bersih 5 march. This is the power Najib gloats about, in his futile attempt to demoralise pro-democracy rally-goers. Contrast the treatment accorded to the son of the vainglorious MP, Tajuddin Abdul Rahman, who allegedly rioted in the parliament compound. The police pleaded with him to give himself up. No black marias. No all-points bulletin issued. No crack police team sent to apprehend the Umno Baru thugs. This is the Umno Baru which festers under Najib’s rule; boorish, ill-mannered and lacking morals. Young Umno Baru Malays who have no respect for the institutions of parliament. They do things differently in Umno Baru. By their definition, their measure of ‘strength’ is the ability to arrest cartoonist Zunar, as he opened his exhibition in Penang. His work was thrashed by thugs, from Umno Baru. Apparently the same gang which stormed the Penang state assembly in 2014. Najib’s strength is shown by the arrest of student leaders, with vice-chancellors suspending their students for their involvement in the Tangkap MO1 protest, or for joining Bersih. The hypocrisy of it all. Najib villifies students, but as a university undergraduate, Najib was said to be involved in Malaysian student organisations in England. Apart from allegedly using the state machinery, like the inspector-general of police (IGP), the civil service and the judiciary, to do his bidding, Najib has one other secret weapon to control Muslims, in particular the Malays. That secret weapon is the PAS president, Hadi Awang. When Najib has bad news to hide, Hadi’s hudud bill is used to maximum effect. Last week, the bad news was Maria’s detention. Najib employs Hadi’s islamic credentials to put the fear of God in Malays. Hadi does have his uses after all. Remember Najib’s last scare, in May? The Wall Street Journal revealed that Good Star Limited was owned by Jho Low. Several hundred millions of ringgits of taxpayer’s money had been sent to Good Star, and then redirected to Najib’s personal account. The distraction was provided by Hadi’s hudud bill, when Minister in the Prime Minister’s Department Azalina Othman Said moved the bill from the bottom of the list to the top of the pile. With her legal and ministerial background, Azalina should have known that this bill goes against the Federal Constitution. Instead of standing up against the male bullies in parliament, she did as they bade her. Social media is perhaps the only place Malaysians can voice their frustrations easily. When the nation vented their outrage against the hudud bill on social media, Azalina performed a perfect U-turn. She then claimed that the PM and DPM had ordered her to push forward the bill. Any fool knows that a nation cannot be ruled by three sets of laws. Civil law, syariah law and one for the élite. Azalina has now been appointed as the Mentor Minister for Universiti Malaya. This does not bode well for the students. The Sunday Star’s photo of Najib looking smug and contented on his Chesterfield sofa, talking about humility does not hide his insecurities and fear from the rakyat. Najib does not realise that he is also describing himself. Najib claimed that his political career had blossomed from the time he became an MP, as a 23-year-old, then a menteri besar at 29, and that he lived with two generations of Umno Baru leaders. What good is a career politician who knows nothing about the suffering of the ordinary rakyat? Look at the Federal Land Development Authority (Felda), which is losing several millions of ringgits allegedly because of mismanagement. Do the Felda settlers realise that Najib’s hand-picked chairperson was once accused of money politics? Crime does pay, as Isa Abdul Samad has been awarded a fellowship from Cambridge University. Najib’s ‘strength’ comes from threatening civil servants who join Bersih, that their employment will be terminated or their wages docked. As more Malays wake up from their slumber, Najib will collude with Hadi, and continue to use Islam as the proverbial whip. Muslims are afraid to speak out, with the millstone of Islam weighing them down. Umno Baru hopes to be returned to power, but they need Hadi’s help. The hudud bill, in Kelantan, is the price Umno Baru must pay for this help; but be warned, hudud is like a cancer, if not excised, it will spread throughout the country. The ‘You help me, I help you’ syndrome is alive and thriving in Kelantan. Najib may think he is strong because the majority of Malays are in denial about Umno Baru. Their silence is Najib’s best weapon. If there were no money politics, Najib would lose his deposit in the general election, and the party he leads would be kicked into oblivion. Najib’s power is defined by the acronym ‘ABC’. He is scared of ‘Aunties’ (Maria), ‘Balloons’ (Bilqis Hijjas) and ‘Cartoonists’ (Zunar). International and local human rights organisations have slammed what they call the continued harassment of cartoonist Zunar, who was arrested during an exhibition in Penang last Saturday. The International Federation for Human Rights (FIDH) and its member organisation Suaram called on the government to "immediately end the harassment of renowned cartoonist Zunar and drop all charges against him". “The arbitrary arrest of Zunar is the latest deplorable act of harassment by a government that is intolerant of any form of peaceful dissent. "Zunar should never again be harassed or deprived of his liberty for exercising his basic right to freedom of expression,” said FIDH president Dimitris Christopoulos in a statement today. The cartoonist, whose real name is Zulkiflee Anwar Ulhaque, was detained under the Sedition Act, for allegedly insulting Prime Minister Najib Abdul Razak. He was released on bail yesterday evening, after the courts denied the police's request for four days remand and gave only one day. Yesterday, anti-Sedition Act group Gerakan Hapus Akta Hasutan (GHAH) reminded the government that Section 3(1)(c) of the Act, which had considered criticism against government as an act of sedition, was removed in the amendments passed on April 10, 2015, and gazetted on June 4 last year. Prior to his arrest, a group led by Penang Umno Youth chief Rafizal Abdul Rahim disrupted Zunar's exhibition and damaged his artworks. However, Umno secretary-general Tengku Adnan Tengku Mansor has denied the party is responsible for this and a spate of other attacks against critics of the ruling party, and no action has yet been taken by the party on any of its members. Suaram reminded the authorities Zunar's political cartoons have earned him worldwide recognition and respect. “Zunar has every right to display the cartoons that have earned him numerous international honours without hindrance by the authorities or pro-government elements. "Authorities must respect Zunar’s fundamental rights to freedom of expression and freedom of movement and investigate those responsible for the recent mob attack against him,” said Suaram executive director Sevan Doraisamy. "The events (over the weekend) are the latest in a series of acts of judicial harassment targeting Zunar," added the two NGOs. Zunar's arrest follows a series of actions including a travel ban and numerous sedition charges against him over the past years. It also coincides with a crackdown on critics and opposition politicians following the peaceful Bersih 5 rally calling for electoral, democratic and government reforms. PKR's newly-appointed secretary-general Saifuddin Abdullah, PKR Penanti assemblyperson Norlela Ariffin and DAP Sekinchan assemblyperson Ng Suee Lim are the latest to be called in to the police station today over Bersih 5. In presenting the Supply (2017) Bill 2016, Right Honourable Chief Minister had laid emphasis that, for the total provision for development expenditure for 2017, RM5.646 billion will be funded by the State while RM282 million will be financed by the Federal government through reimbursable loans and grants. In percentage term. For 2017, to finance the development expenditure for Sarawak that will cost RM5.928 billion, the contribution from the federal government is a mere 4.75%. RM4.75 will be given to Sarawak for every one hundred Ringgit of our need for development. The Right Honourable Chief Minister has been most diplomatic and benevolent in his choice of word, to remarked that the allocation from the federal government is “barely sufficient”, and that “It is just not enough”, referring to page 17 of the unedited version of the Hansard dated 21 November 2016. That is no much difference from this year, and the year before. For 2015 Budget, the development expenditure was RM4.546 billion. We ourselves funded RM4,038 million while the federal government financed RM508 million. In the budget for this year, the total provision for development expenditure was RM5.971 billion. The federal government’s contribution was a mere RM231 million and the State has to finance 96% of the development expenditure, RM5.74 billion. For every one hundred Ringgit that Sarawak needs for development, the federal government gives us RM3.80! “Tidak cukup”… This was repeated twice by YAB Chief Minister as recorded in page 9 of our Hansard dated 7 December 2015, when referring to the federal allocation. We are diplomatic, we have been diplomatic, but is the federal as benevolent as we think they should be? I think we have been taken for a ride, by Putra Jaya. So, I thought we should take it with a pinch of salt when the Prime Minister publicly said in UPKO meeting in Kota Kinabalu on 12 November 2016 that he is ready to discuss the Malaysia Agreement and any wrong interpretation of constitution provisions, that he would not take away our rights but would defend them. Hence I cannot comprehend the basis for our Deputy Chief Minister to expressed “deep appreciation” to the Prime Minister “for his willingness to discuss issues relating to the Malaysia Agreement and the federal constitution with us and for his assurance that he will defend our constitutional rights”, in his ministerial statement delivered on 22 November 2016. There is no need to sing the praises about his support, understanding and assurance. I would respectfully invite the Honourable DCM to look at this Budget and enlighten this Honourable Dewan, where is the spirit of goodwill, diplomacy and mutual respect that have been shown by Putra Jaya, to convince all the Honourable members and Sarawakians outside this Chamber that we should give the federal government time to deliver what are due to Sarawak under the Malaysia Agreement and the Federal Constitution. 3. review and amend sections 3 and 4 of the Territorial Sea Act 2012 (Act 750). If the Prime Minister and the federal government has any respect for Sarawak’s rights under the Malaysia Agreement and the Federal Constitution, that there is spirit of goodwill, diplomacy and mutual respect to Sarawak, what are the outcome of the Sarawak government’s requests for these basic rights and entitlements guaranteed under the Malaysia Agreement and the Federal Constitution? Datuk Speaker, while we should continue to remind the federal government of their obligations to grant Sarawak equitable financial allocation to catch up in our development of public facilities and infrastructure with the Peninsular Malaysia, we should transform and develop strategic financial measures to amplify and multiply our state revenue through prudent management of our resources. We could and should have better managed our forest resources, emulating Peninsular Malaysia and Sabah, to zealously develop value added downstream industries and ensure that our timber and timber products are able to be traded in the “high value markets” hence generating more revenue while better conserve and sustain our forest resources. Foremost in our mind, critical in our pursuit to conserve depletable natural resources, is the petroleum justice that we owe it to ourselves, to Sarawak and our future generations, to strategically conserve and utilize in the best interests of Sarawak. We are blessed with this natural endowment, but it is fast depleting. Onshore and offshore, Sarawak has been demarcated into 48 blocks or fields of oil and gas potentials. Through the years, production sharing agreements (PSC) had been awarded over 27 of these fields and 13 others are presently been vigorously promoted this year and the last. It is imperative for us to revivify Sarawak’s sovereign rights to this valuable natural resource, to assert our autonomy and authority over the remaining blocks and fields of oil and gas potentials yet to be awarded with PSC. We have sacrificed too much of our petroleum resources to the Federation. At the time when the Petroleum Development Act was tabled in Parliament and passed, in 1974, there were nine oil companies that are prospecting for oil in the country’s territory – 3 in West Malaysia and 6 in East Malaysia. Amongst them, only Sarawak Shell Berhad was producing oil of about 93,000 barrels per day. The production was increased by more than 2-folds after the Petroleum Development Agreement was signed and soon more than 4-folds production, i.e. 400,000 barrels per day, to finance the Federation’s development. In June 2009, Petronas then president and acting chairman Tan Sri Hassan Merican revealed that Petronas had until that year paid RM471 billion to the federal government and assumed a cumulative gas subsidy of RM97 billion. For that particular financial year ended in March 2009, Petronas had paid to the government RM30 billion in dividends, and the national petroleum company had paid RM29.4 billion in taxes, RM6.2 billion in royalties and RM2.2 billion in export duties. Thus contributed RM67.8 billion to the federal government that year, as compared to RM56.8 billion in 2008. Dividends alone, Petronas had paid to the federal government RM30 billion, RM30 billion, RM28 billion, RM27 billion, RM29 billion, RM26 billion and RM16 billion respectively from 2010 to 2016, hence RM671 billion for the 42 years since its incorporation. All these besides the estimated RM500 billion in taxes, royalties and export duties, together with RM200 billion in gas subsidy. Needless to say, Sarawak is the biggest contributor in terms of oil and gas production and petroleum revenue earning for the Federation. But Sarawak’s revenue earning from the oil and gas production was only a small fraction of that of the Federation, being just the diminutive royalty. We should laud the state administration to devise the petroleum regulatory framework to assert better safeguards for the interests of Sarawak, but I must again reiterate the need for Sarawak to set up a state petroleum company under the state sovereign wealth fund to venture into upstream and downstream oil and gas industries, for the betterment and long term interests of Sarawak. I would respectfully seek the assurance of YAB Chief Minister that any future signing and awarding of PSC, such as Block SK410B, will not be done without our knowledge and sanction, and we must insist on direct participation in the ventures. “We cannot be satisfied by being just spectators. We want to participate actively and meaningfully in the oil and gas industry in our State,” our YAB Chief Minister has famously said this in Bintulu earlier this year. Our Honourable DCM had repeated it in his ministerial statement in this august House. Rome cannot be built in one day. But we can wait forever and federal will not build Rome for us in Sarawak. We must build all that are necessary in Sarawak, on our own. In a landmark decision today, the Court of Appeal has struck down Section 3(3) of the Sedition Act 1948, meaning to cite a person of sedition, the prosecution must now prove intention. The ruling of the court would have an impact on all ongoing sedition cases, said lawyer N Surendran. This happened in the case of Mat Shuhaimi Shafiei vs DPP Public where the lawyer appeared for the Sri Muda assemblyperson. A three-member bench chaired by Justice Lim Yee Lan unanimously allowed the appeal. Justice Varghese George Varghese, who delivered the judgment, ruled that Section 3(3) contravenes Article 10 of the Federal Constitution regarding freedom of expression, and therefore it is invalid and unenforceable. "This is a novel constitutional challenge, the specifics of which were never litigated before," he said. The other judge presiding on the panel was Justice Harmindar Singh Dhaliwal. Justice Varghese said Section 3(3) failed the test of proportionality, which is contained in Article 8 of the constitution. The judge said there were merits in Mat Shuhaimi's application as Section 3(3) was a total displacement or removal of any consideration or necessary finding of intention of the accused or termed 'mens rea' which was an essential ingredient to be proved in criminal proceedings. In criminal law 'mens rea' or proof of intention behind the purported act, had always been an essential element to show culpability of a crime. Justice Varghese said although Section 3(3) stated the intention of the person charged was deemed irrelevant, in this court's assessment, it was not to create a presumption which the accused could disprove. “More significantly, apart from seeking to totally relieve the prosecution of the burden to prove intention, ...that provision also had the effect of putting the issue of the accused's intention beyond judicial consideration; such would not have been the drastic effect if such restriction was couched as a rebuttable presumption,” he said. The judge also said that Section 3(3) also was in conflict with Section 505 of the Penal Code, where intent had clearly to be proved for any offence in the Penal Code. “It was indisputable that an accused under the Sedition Act would be clearly disadvantaged and in effect be discriminated,” he said, adding that this would open the door to selective prosecution. As a result, Justice Varghese said the panel was unanimously of the view that Section 3(3) was in violation of the constitutional right of a citizen to be treated equally under Article 8. “Hence, we order Section 3(3) of the Sedition Act 1948, contravenes Article 10 of the Federal Constitution and therefore is invalid and of no effect in law,” he said. Mat Shuhaimi was charged in February 2011 at the Sessions Court in Shah Alam with posting an allegedly seditious article in his blog, srimuda.blogspot.com, on the appointment of Mohd Khusrin Munawi as the new Selangor state secretary. He was alleged to have committed the offence at Pusat Khidmat Rakyat, Jalan Anggerik Vanilla, Kota Kemuning in Shah Alam on Dec 30, 2010. Mat Shuhaimi is the political secretary to Selangor Menteri Besar Azmin Ali. Surendra Ananth says Deputy Prime Minister Ahmad Zahid Hamidi's assurance to the public that the bill is not about hudud, but only to empower the shariah courts, is misleading. PETALING JAYA: Marang MP Abdul Hadi Awang’s proposal to allow shariah courts to impose punitive punishments on Muslims can still pave the way for the introduction of hudud, a lawyer said. Surendra Ananth said three offences, qazaf, al-lian (for husband) and syurb could be implemented in all states. He said Deputy Prime Minister Ahmad Zahid Hamidi’s assurance to the public that the bill was not about hudud but only to empower the shariah courts, was misleading. “This is a big misconception. The said bill will pave way for the enforcement of hudud,” he said in a commentary on the proposed legislation. Surendra, who is also deputy co-chairperson of the Malaysian Bar constitutional law committee, said this matter needed clarification as a number of MPs were making statements that the bill was not about hudud. Yesterday, Hadi deferred debate on his private member’s bill to empower the shariah courts to mete out sentences up to 30 years’ jail, RM100,000 fine, and 100 strokes of the cane. Currently, shariah criminal punishment is capped at three years’ prison term, RM5,000 fine, and six stokes of the cane. Surendra said the Kelantan Syariah Criminal Code II 1993 (as amended in 2015) provided for eight hudud offences and three of those could be implemented if the maximum punishment sought was approved by Parliament. He said the offence of Qazaf (false accusation of adultery) and Al-li’an (false accusation of adultery by husband, on oath, against his wife) carried a punishment of 80 lashes. Those found guilty of Syurb (consumption of liquor or intoxicating drinks) could be whipped a minimum of 40 times and a maximum of 80 times. Surendra said one need not specifically label the bill, but it was hudud as long it provided for such punishment. He said state legislative assemblies could create any Islamic offence within item 1 of the state list, as long as the punishment for the said offences was within the limit set by Parliament. Surendra said the implications of the bill was clear that the amended law would affect every state and was also against the basic structure of the constitution. He said if the shariah courts were given powers (even wider than the civil courts for caning), it would upset the deference given to Parliament on matters of criminal law. He said civil courts were superior while shariah courts were specialist courts, but confined to the state. KINIGUIDE The arrest of Bersih chairperson Maria Chin Abdullah has sparked renewed calls to abolish the Security Offences (Special Measures) Act 2012 (Sosma). Her detention under Sosma since Friday last week has thus far sparked at least two protest marches, and three nights of protests close to Dataran Merdeka. What is this law, and why do its opponents deem it ‘draconian’? In this instalment of KiniGuide, we will take a look at Sosma’s 33-pages and why it has become so controversial. Sosma was passed by the Dewan Rakyat on April 17, 2012, to replace the Internal Security Act 1960 (ISA), after longstanding complaints that ISA is a draconian law that is prone to abuse. Sosma provides the police with more powers to detain people and conduct investigations, and more leeway for prosecutors on what evidence they can tender in court. This is meant to help authorities tackle security offences, particularly terrorism. It was enacted pursuant to Article 149 of the Federal Constitution, which allows for laws to tackle subversion, organised violence and other threats to be valid even if such laws violate some of the fundamental liberties provided by the constitution. Even during the debates in Parliament that led to Sosma being passed, concerns were raised that Sosma would be abused for political purposes, despite its safeguards. For Sosma’s critics, last Friday’s arrest of Maria is a further vindication of those fears. Similar concerns had also been raised late last year, after the former Batu Kawan Umno division vice-chief Khairuddin Abu Hassan and his lawyer Matthias Chang were arrested. Khairuddin and Chang were held under Sosma and were subsequently charged under Section 124L of the Penal Code, for trying to sabotage Malaysia’s banking and financial services sector. Sosma provides additional powers to the police and to the prosecution, superseding those provided under the Criminal Procedure Code (CPC) and the Evidence Act 1950. For example, under the CPC, the police may only detain a suspect for up to 24 hours to facilitate investigations. If it is deemed necessary to detain the suspect further, the police would have to go to court to apply for a remand order. The magistrate may or may not grant the full amount of time requested by the police, or turn down the request altogether and order the suspect’s release. A remand period may last up to 14 days, including a one time extension, depending on the offence being investigated. In contrast, Sosma allows the police to detain suspects who are investigated for a security offence to be held for up to 28 days, without any judicial oversight. Under Sosma, the police may also compel married persons to disclose the communication between them, although such compulsion is ordinarily prohibited under the Evidence Act 1950. In addition, bail will not be granted for those charged with a security offence. This means the accused would have to remain in prison for the duration of his trial. The exception is for a person is underaged, a woman, or if sick or infirm, in which case the accused may be released on bail, but with an electronic monitoring device attached. Trials under Sosma also allow for ‘protected witnesses’, who would testify in court behind a closed door and in the absence of the accused or his counsel. When do Sosma’s ‘superpowers’ apply? Sosma’s ‘superpowers’ apply to offences under Chapters VI, VI-A, VI-B of the Penal Code, Part III-A of the Anti-Trafficking in Persons and Anti-Smuggling of Migrants Act 2007, and the Special Measures Against Terrorism in Foreign Countries Act 2015. These offences are defined as security offences under Sosma. Examples of provisions that come under Sosma include Section 124L of the Penal Code (Attempt to commit sabotage) and Section 124C (Attempt to commit activity detrimental to parliamentary democracy). Section 124C is the offence that Maria is being investigated for, whereas Section 124L is the offence Khairuddin and Chang are accused of. Both come under the Chapter VI of the Penal Code, which deals with offences against the state. Meanwhile Chapter VI-A of the Penal Code deals with terrorism, while Chapter VI-B deals with organised crime. Part III-A of the Anti-Trafficking in Persons and Anti-Smuggling of Migrants Act 2007 deals with the smuggling of migrants, while the Special Measures Against Terrorism in Foreign Countries Act targets those travelling abroad from Malaysia to commit acts of terrorism. Does it always apply to these offences? There appear to be some exceptions. After Khairuddin and Chang had been charged under Section 124L of the Penal code, they were initially denied bail under Sosma. However, the High Court in Kuala Lumpur later ruled that Khairuddin and Chang’s alleged offence do not fall under Sosma and allowed them to be released on bail. High Court e judge Mohd Azman Husin said this is because financial services - which the duo are accused of sabotaging - do not come under the ambit of Article 149 of the Federal Constitution. Article 149 is applicable only in six different situations, such as when a substantial body of people threatens to promote ill-will and hostility between different races, or to excite disaffection against the Yang Dipertuan Agong or the government. Section 4(3) of Sosma states, “No person shall be arrested and detained under this section solely for his political belief or political activity,” referring to the section that deals with the power of arrest of detention. This includes the power of the police to detain a person suspected of a security offence for up to 28 days. “Political belief or political activity” here, is defined as lawful activities that, among others, include the expressions of opinions or the pursuit of actions that are directed toward any government in Malaysia. Members of registered political parties engaging in the activities of their parties are also protected from arrest and detention under Sosma. This is because ‘the expression of an opinion or the pursuit of a course of action made according to the tenets of a political party’ is considered to be a political belief or activity under Sosma. In addition, the power of the police to extend the detention period from one day to a maximum of 28 days has a ‘sunset clause’. If the power to extend the detention period is not renewed by both Houses of Parliament every five years, it automatically becomes null and void. Another safeguard is the judiciary. An aggrieved person who believes he or she is unlawfully detained may file a habeas corpus application to the court. If the court determines that the person is indeed being held unlawfully, the court may direct for his or her immediate release. This is the course of action currently being pursued by Maria’s lawyers.